Studying martial arts almost his whole life, Craig Sanderson is a highly motivated instructor who is dedicated to his students. As a profession, Craig works in the mental health sector which is evident in his calm, understanding approach to each individual in his class. Craig does not allow difference to stop his students from achieving their goals and is able to develop realistic programs for each person who comes into his dojo, offering a fully inclusive club for all. Craig is a 4th Dan in Shotokan Karate Do which has been the backbone to his training and teaching shortly followed by Karate Jutsu. Craig has also developed a variety of experience in other arts including the weapons based system of English Combat and empty hand Chinese martial arts. 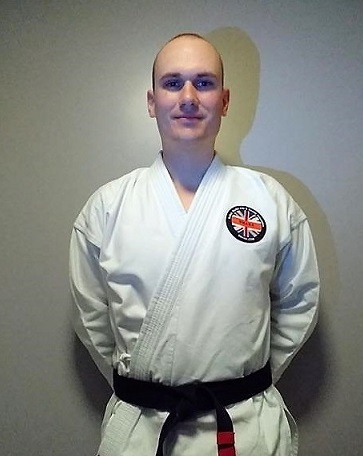 The wealth of martial arts experience and hard work gained throughout his life has seen Craig develop his own syllabus, incorporating the benefits of traditional Shotokan Karate Do whilst drawing on techniques and understanding of how to use self defence in real world situations. “I have studied martial arts since I was five years old and it has undoubtedly contributed to the confident, autonomous individual that I am today. I started off studying Shotokan Karate Do and as I progressed into my Dan grades I began to ask questions about the aspects that I felt did not apply in real world situations. Exploring these questions opened up the fascinating complexity of the art but also drew me to additional training in Karate Jutsu. This was complimented by 2 years of studying English Combat while drawing on techniques from Chinese martials. During the search for my answer I incorporated Street Defence, Conflict resolution, Shotokan Karate-Do and a hint of the other arts into my C.J. Sanderson Karate Defence syllabus. This enables the benefits of the traditional art to be fully utilised while still understanding and learning the elements of self defence which need to be cemented into training to be fully effective in the modern Western culture we all live in. The greatest gift to me as a martial artist is to teach others and to see them develop as individuals along their martial arts journey. It is my objective to provide as much support and training for all of my students, helping them develop a peaceful demeanour and excel in physical and mental fitness. I aim to use martial arts as a tool to help each student develop their best possible future self.